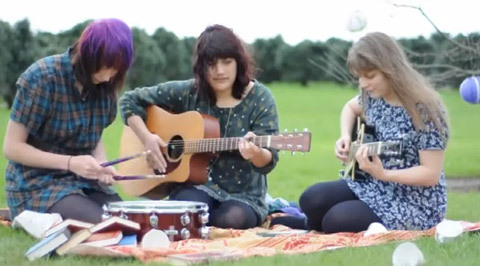 The three young women of Hello Riley have described their sound as “a warm-house fire”. Certainly it is a feel-good sound, relaxed and comfy, but chirpy & jaunty too. They currently have an EP Daughters of Eve for sale at Bandcamp, and have profiles on Myspace and Musichype. Corinne Tan as made a sweet little video for Summer Day, the song featured here. Hello Riley also feature on the latest Musichype NZ Indie Mix Tape LP – for good reason – there is a maturity and individual character to their song-writing and musicianship. As they are still nippers and unsigned, they are certainly one-to-watch. This entry was posted in Music and tagged Auckland music, Carlie Dyer, Catherine Ellis, Hello Riley, new music, New Zealand indie bands, Peta Edmonds. Bookmark the permalink. ← Book Vending Machine – the Novel Idea – it’s down the shute!